First line: "His fingertips slid along my back, applying hardly any pressure, yet sending shockwaves over my flesh." Ordinarily, I wouldn't recommend skipping books in a series. Especially by the third book, there may be too much background info to catch up on. However, Shadow Kiss has enough exposition in it, the author seems determined to bring everyone up to speed and rope in new readers with this later addition, if necessary. 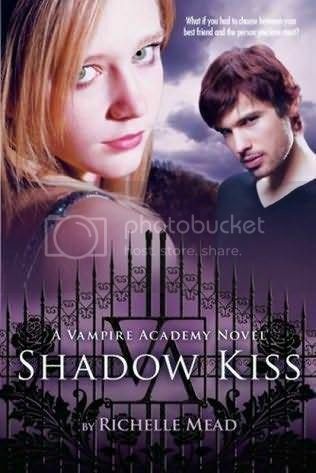 I think readers will enjoy the first two books of the Vampire Academy series, but if you are looking for some resolution to the romantic conflict and a dramatic cliffhanger ending, readers will do fine to go directly to this book without reading the others first. In this installment, we return to St. Vladimir's, an exclusive private school for young vampires. Physically weak, Moroi have elemental magic. Half-human, half-vampire dhampirs train to be their bodyguards. Immortal, evil Strigoi are recognizable by their pale skin and red-rimmed eyes. The class tensions inherent in vampire society are finally beginning to bust apart at the seams. Once again, dhampir Rose is torn between love and duty as she struggles to keep her growing feelings for her tutor Dimitri under wraps as she protects her Moroi friend Lissa from Strigoi attacks. Rose has already earned two molnija marks (the Russian word for lightning) on the back of her neck for killing Strigoi. This book includes a huge battle scene, which earns her a molnija star tattoo meaning she's killed too many Strigoi to count. The end of Shadow Kiss brings plenty of tension and excitement. As graduation nears, Rose has begun seeing ghosts. She also finally ends up making love with Dimitri but almost immediately loses him to a Strigoi attack brought on by some foolish underclassmen, intent on hazing new members of their secret club. Christian, Lissa's boyfriend, uses his fire magic successfully in the attack, and many of the highborn Moroi are forced to re-evaluate their own 'helplessness' and the necessity of ascetic lives for their dhampir bodyguards. Rose's friend Lissa has been cavorting about, oblivious to the near-slavery that Rose has been facing as her protector, and finally gets a long-overdue wake-up call about how selfish she's been when Rose ultimately abandons Lissa to drop out of school, mere days before graduation, to hunt down and confront the now-Strigoi Dimitri.